My father in law looked at me totally baffled yesterday as he was trying to work out exactly which children were staying at my house and which werent. Two of my kids had stayed at my friend, Rosies the previous night and she had just turned up to drop them off. In the mean time another friend, Claire was leaving my house. ‘ok, leave Caolan with me !’ I yelled back. Rosie then went to leave, turned to her two girls and told them to be good and she would see them in the morning. I could see my father in law trying to work it out like a tricky maths question. You know the ones, if three men got in the boat, one fell out and they pick up four, how many are left in the boat? They all made a camp in the living room and went to sleep. …..our at least I thought they had. 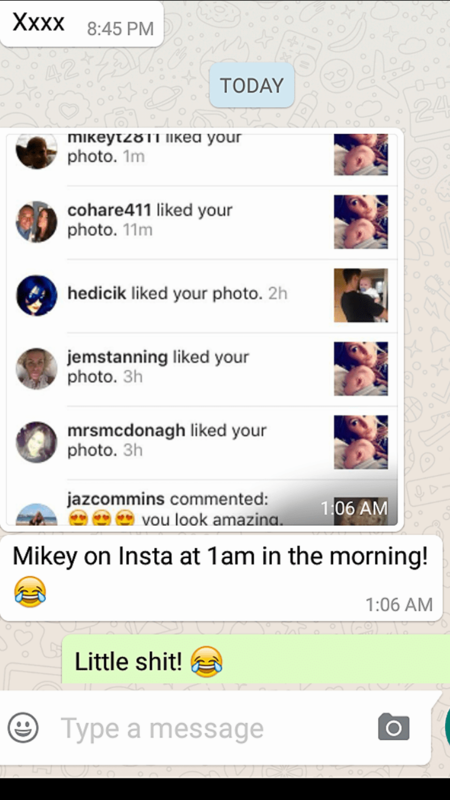 Along with a pic of her INSTAGRAM with Mikey liking her photo at 1am! Oh good im so pleased that after a week, you finally get over the jet lag and then you stay awake ALL Night.